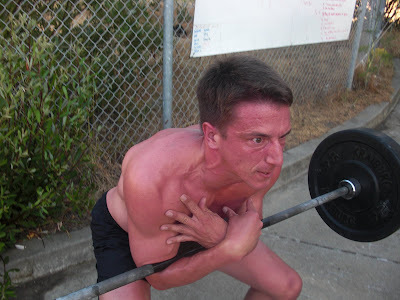 San Francisco Crossfit: What Happens Under Stress? What happens to you under periods of peak stress? Do you get angry? Do you rally? Does your easy positive mood change to short tempered negative self talk? One of the side effects of our difficult training is that we regularly place ourselves directly in the path of very stressful experiences. So in a sense, we practice being stressed out. During your next workout pay attention to what happens to your mindset and it's effect on your productivity and success. Don't get me wrong, channeling crazy "horse eye" can be very effective and works well for Matty T.
Matt, you look like you've gone absolutely insane here. Way to rally. The scariest thing I have ever laid eyes on. The horror of this image will haunt me forever. Matt make sure to show this picture to the girls bidding on you for the next bachelor auction. I think that's what it looks like when your soul leaves your body. Terrifying, and yet awesome at the same time. That is totally metal. Metal!! Lucas, I can only see this doubling any potential bids for me. I am in Redding and bored in my hotel room (but cool). Miss Crossfit. I did the heavy deadlift workout Saturday and it hurt. Would like to try the 155lb. clean and jerks if the local crossfit gym will let me in. Running around in 112 degree heat through marijuana fields will get old though I have to say there is a physical challenge to surviving this heat while wearing all my equipment. I am offended and surprised by what I am seeing here. Foreign nationals running around with assault rifles in the forest not hundreds of yards away from vacationing families. They set up shotgun booby traps for law enforcement among a myriad of others hazards. Law enforcement is not nimble enough nor do they have requisite legal authority or strength in numbers to deal with this threat. Am looking forward to coming back and working out under the bridge. That picture is awesome! That is the same face Matt makes while he is grunting on top of me in bed every night.